® – see and understand procurement risk. Procurisk provides actionable data by identifying risk in your supply chain activities. It is a tool that helps you populate your procurement risk register. Procurisk identifies #1. so your approach to #2 can inform your business strategy. Corporate risk management is an essential business activity. Risk mitigation strategies lie at the heart of Corporate Governance. What is the contribution to these mitigation strategies from the Procurement & Supply Chain Management function? It is rare to find robust methodologies in place that will, in a structured way, identify the potential risks. 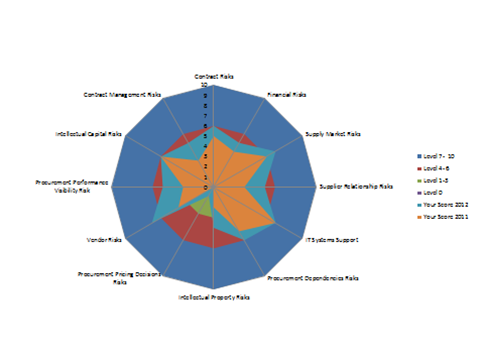 Procurisk ® facilitates a structured assessment of Procurement & Supply Chain Risks. The outcome enables your organisation to focus attention on those facets of risk requiring action. We have defined 12 specific areas of Procurement and Supply Chain risks, each carefully designed Metrics against which to evaluate current practice. Contractual Risk is an example of a key area. There are organisations who have not reviewed their contractual terms and conditions for many years. There are others who trade on the supplier’s terms, or worse, trade without formal written contracts in place. Price Management Risk is another area and, for example, risk exists when the basis of contract prices are not understood because the supplier’s cost drivers were neither requested nor negotiated. Some contracts have automatic year-on-year escalation where the price is linked to an index, such as the Retail Price Index. Intellectual Capital Risk is an area rarely evaluated. The risks presented by not developing human capital and failing to motivate the procurement and supply chain team will weaken the long-term strategy of developing relationships with strategic suppliers to encourage innovation and positive change that maintains the buying organisation at the cutting edge of performance. Procurisk ®: three approaches available to you. Self Assessment where you have complete online access to Procurisk and receive your risk positioning status online. Health Check where you have the services of a BFL consultant to sample the Procurisk responses to confirm that the client’s judgments are founded on sound logic. Embedded Analysis where you have a BFL consultant visit your offices to lead the procurement risk modelling and be fully supported by your specialists. In both the Health Check and Embedded Analysis a positioning report will be issued to you. dramatically enhancing the negotiation of contract terms and conditions. The reputational benefit from being able to demonstrate effective procurement and supply chain risk management will be a business differentiator when tendering for new contracts. Click Procurisk ® for details of the procurement risk evaluation tool or give Ray Gambell a call on 01744 20698 or email r.gambell@brianfarrington.com.